Mai and Kat got together again on Saturday night. This time they headed to Ala Moana Shopping Center. Mai bought L’Occitane’s Fabulous Serum, which Kat has been using. It is a serum which has shea butter in it and is quite inexpensive as far as serums go. It is ideal for dry and dehydrated skin and is supposed to repair prior damage and protect the skin in the future. My hometown,Nagano is still snowing...I'm really looking forward to seeing Sakura blooming in here too. I love sakura! 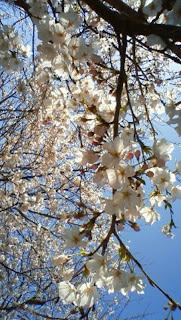 I hope that I can do hanami one day.